For me, the most stressful part of planning a trip is booking the right hotel. The price has to be right. The distance to town should not be too far. The beds should be comfy with no bed bugs. I guess that’s the reason why I keep choosing Tune Hotel when there’s a branch at my destination. When I found out that there was an opening sale for the new Bangkok branch. 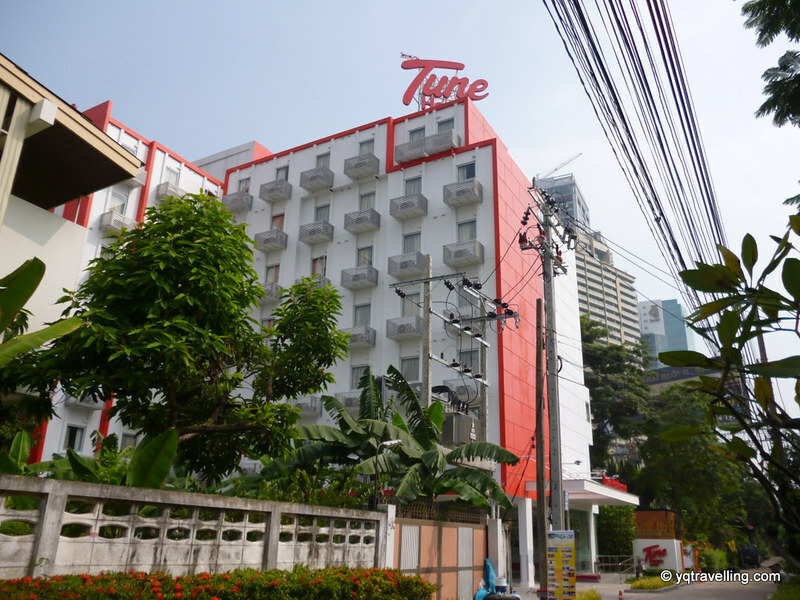 Tune Hotel – Asoke, I immediately made my booking. 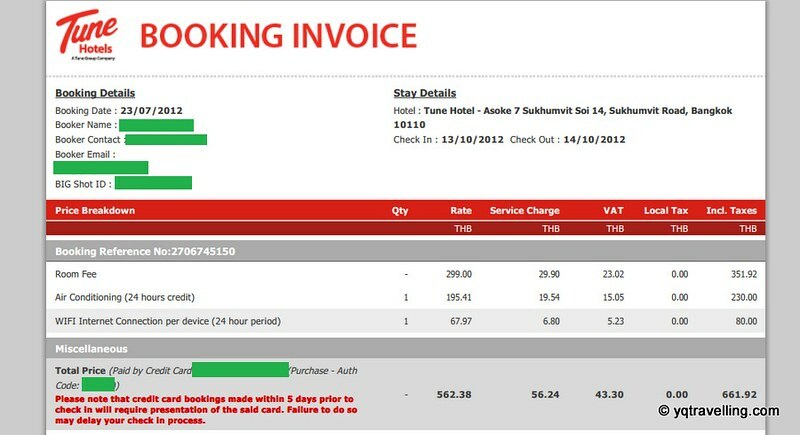 During the sale, the basic room fee was 299 baht before taxes, Based on my past three experience staying at different Tune Hotels (Kota Bahru, Ipoh and Kuching), I decided that I needed to add on 24 hour airconditioning and Wi-Fi. The bill came around to 661.92 baht. It’s a bit tricky to find how to take public transport from Don Muang airport to Tune Hotel as even the Web site is vague. I printed out the hotel name and address (in English and Thai), showed it to the lady at the taxi counter who gave me a slip of paper and told me to wait for a cab. To reach the hotel, the cabbie had to drive into the narrow lane of Sukhumvit Soi 14. The trip came up to be about 210 baht, even though the lady at the airport said it might be 350 baht. If you are taking the public transport to Tune Hotel Asoke, stop at the BTS Asoke station. You will see a sign pointing to the hotel. Actually, you can see the hotel from the station. The hotel sticks out like a sore thumb (in a good way) among the posh housing. The guard was very enthusiatic about helping me with my luggage. Unfortunately, I only had a backpack so he couldn’t help me. If you are heading out, he can help you call a cab too. When I reached, there was about 15 minutes before checkin time 1400. The receptionists were very strict about the time so I sat at the bench with the other early guests. There was a play area where you can take photos of yourself and send it to your e-mail box. Finally! 1400 hours arrived. I queued behind some of the guests who were even more anxious about checking in. There was quite a long form to fill out. The receptionist also scanned my passport and the immigration entry form. 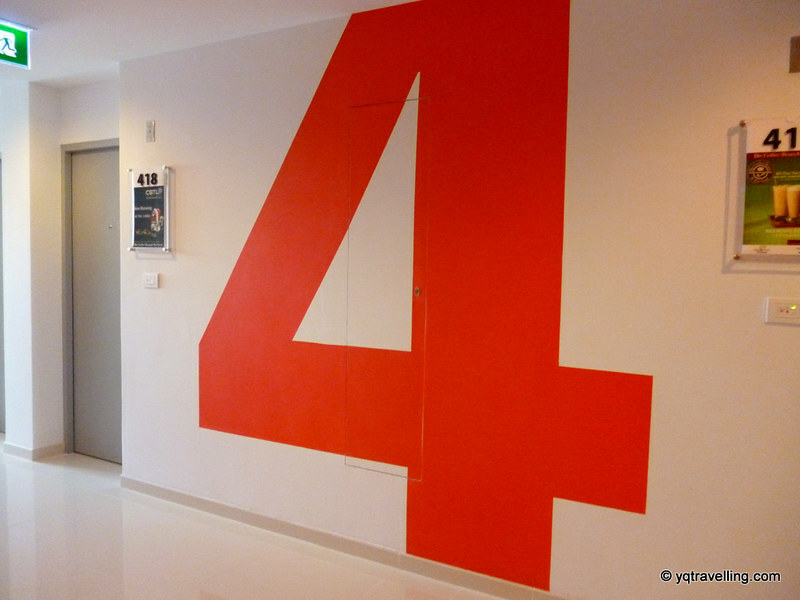 I was roomed on the fourth floor which is not the most auspicious. 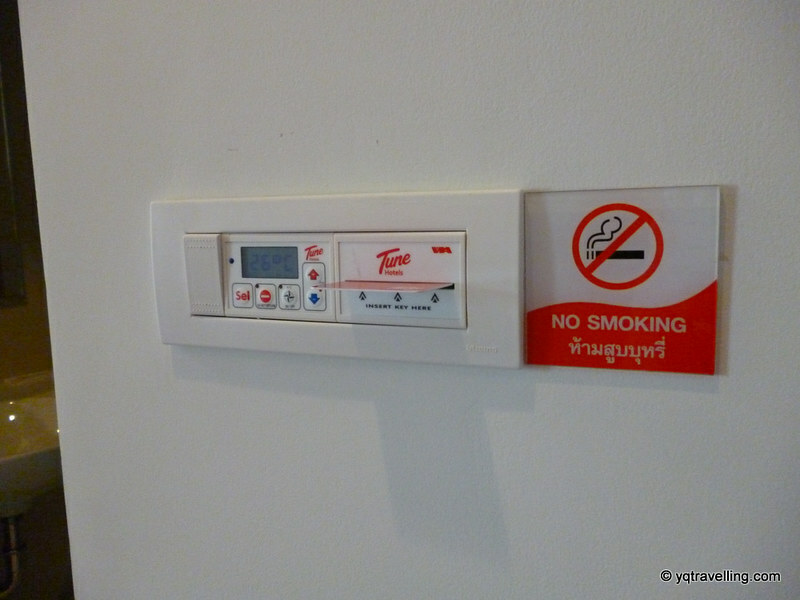 As the hotel only opened recently, everything was brand spanking new. I was quite happy that the toilet did not smell mouldy like it did in Kuching. 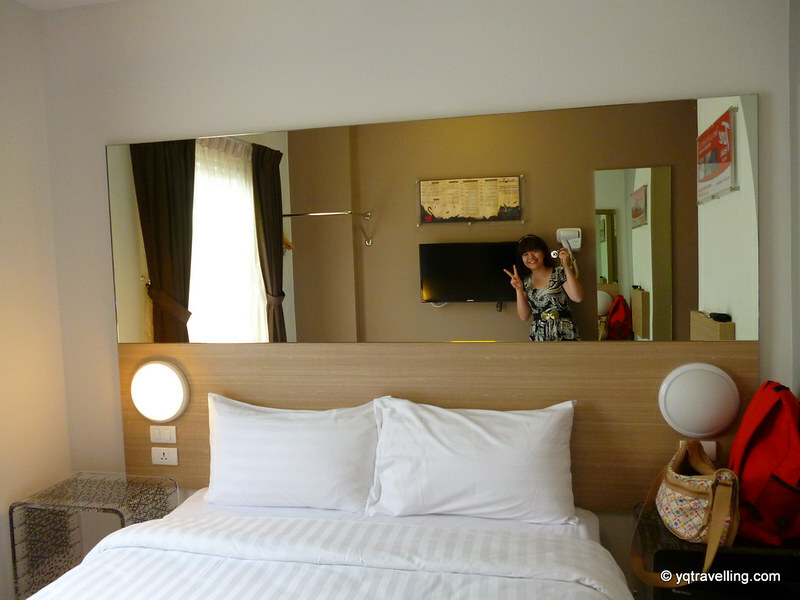 Strangely, there was a large mirror above the bed. It made the room seem larger but I cannot figure out what it is for. Since I booked 24 hours of airconditioning, the key slot did not show the count down to my airconditioning-less hour. 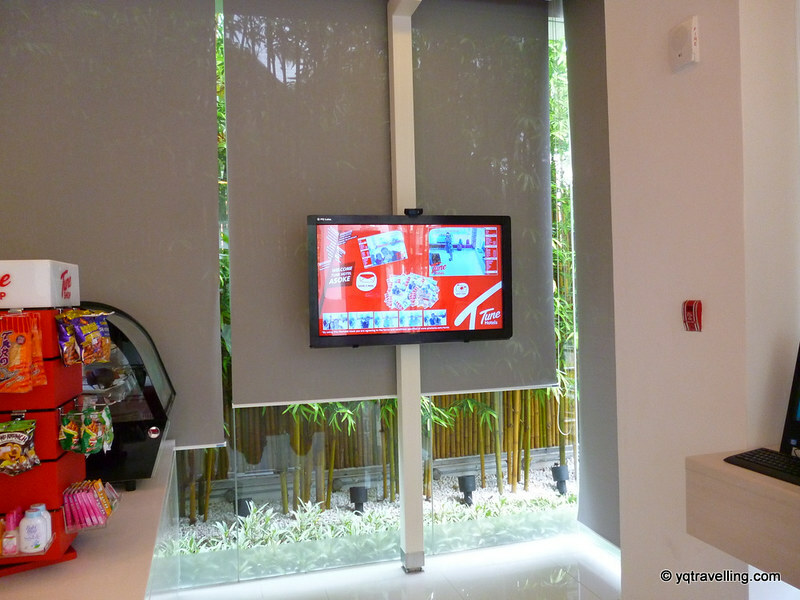 As usual, there is a TV (which you can pay for) but I used it as towel rack. 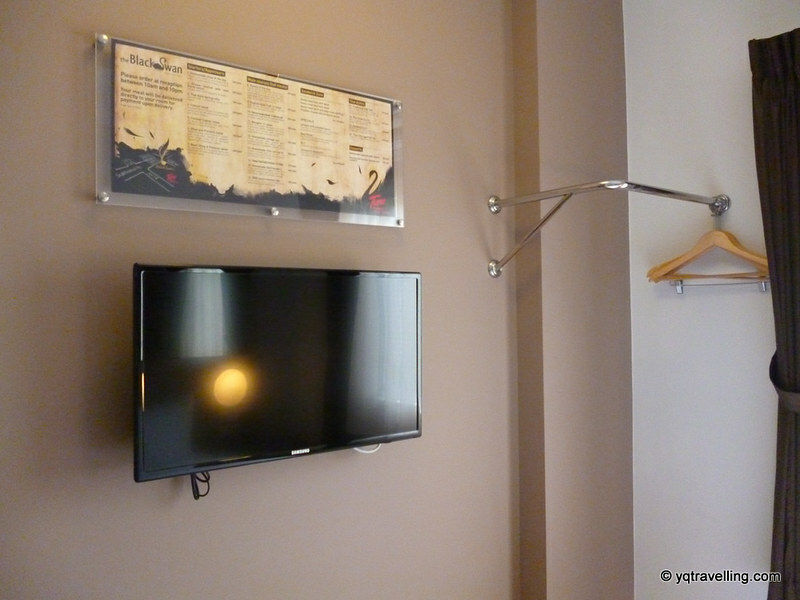 There’s also a menu for room service above the TV. The food is a bit overpriced though. 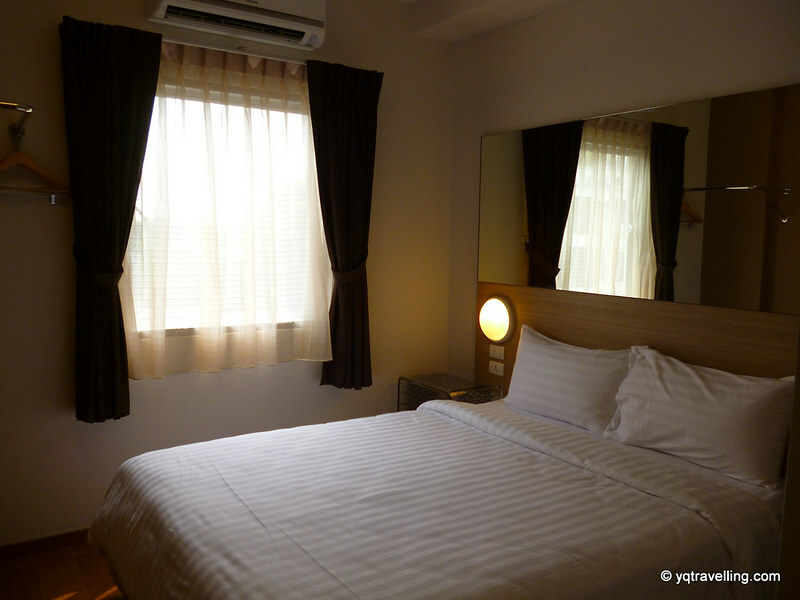 Wrapping up this post, I love everything about Tune Hotel Asoke, the location and price. Follow me on Twitter or share a thumbs up on Facebook. Wow the room looks damn swag and very hip too! 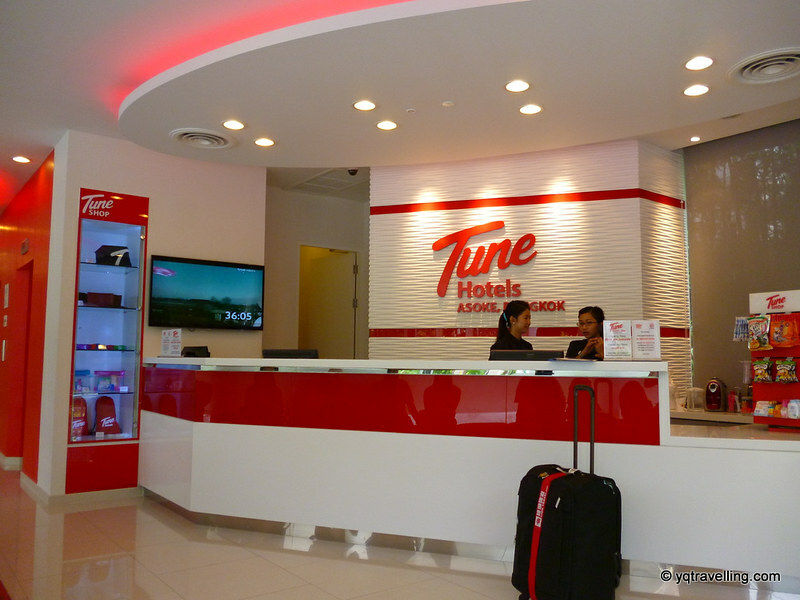 Tune Hotels are minimalist chic. Too bad there’s no bathtub. HELLO… what’s happening nearby the hotel at nite? see from map its near terminal 21, walking distance? Hi! Yes, Terminal 21 is just opposite the entrance to Soi 14. 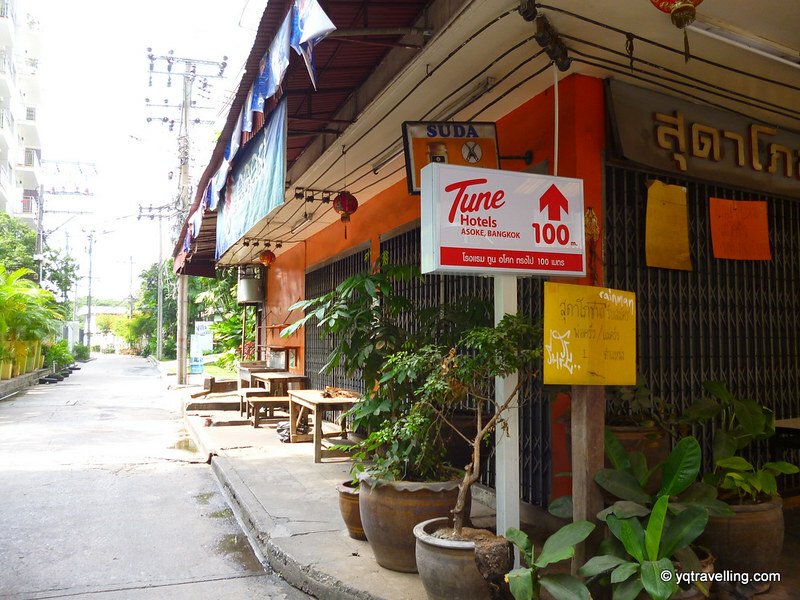 At night there’s not much around, except Soi Cowboy which is nearby. NIce hotel you get there, and maybe i will book it for my bangkok adventure this february..
Just want to ask, if you might know, is there any extra-person charge at the hotel? I do not know if they charge extra for each person. But I know that they have rooms for single and double. Hi! I felt very safe when I was there. I walked back from the massage place at 10pm and it didn’t feel dangerous. Highly recommended. Thanks! With your assurance, I’m very glad. Just one more question, if I purchase the 24hr aircon, tv, Internet package, does it mean that I will have that throughout my 4 day stay? Hmm… i don’t know about that. I suspect it’s only for one day because Tune Hotel’s rather stingy. Pretty informative blog! I found it very helpful about my next trip to Thailand. I am planning to go to Thailand after completing my bus tours to Grand Canyon from Los Angeles. I was little confused regarding my stay there but this great piece of sharing solve my problem. 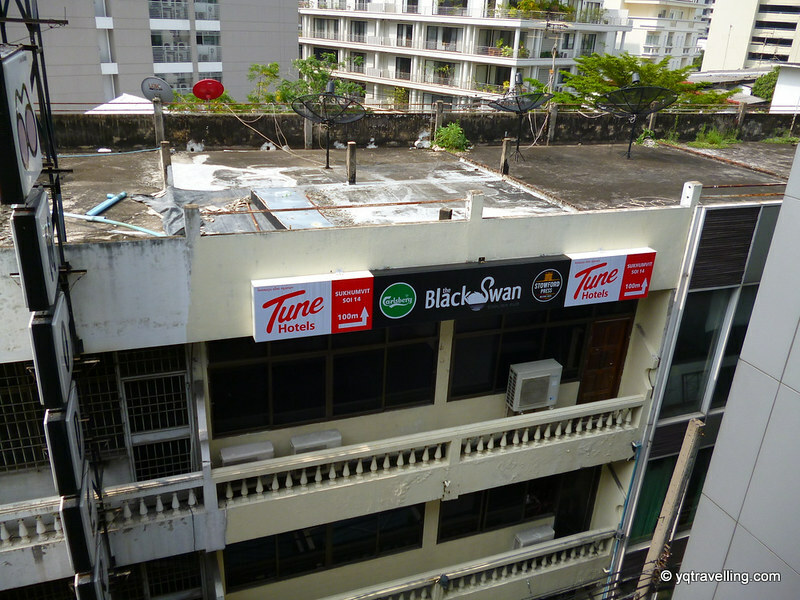 Now after visiting this blog I have decided to choose Tune Hotel Asoke, Bangkok to stay there. Let me know is August best to visit Thailand.